Should Trump Stop Sending Aid Money To The Countries Migrants Originated From? It was another session of tough sledding as only two S&P sectors finished in the green on Monday, and only four are higher year-to-date. Investors nibbled at several down swoons but focused on fewer names; they have lost faith in the value or fundamental valuation propositions. Without a doubt, the continued weakness in Financials (XLF) is a serious red flag for the entire market. Interestingly, broad market worries about more rate hikes that were supposed to be the catalyst for banks. However, even after strong earnings results from Goldman Sachs (GS) and Morgan Stanley (MS), they looked terrible. Ironically, one story that was released yesterday suggested Goldman Sachs will begin to focus on banking customers with checking accounts, credit cards, and mortgages. It sounds like they want to be a bank. Speaking of interest rates, it turns out President Trump is not the only chief executive concerned about a rogue Federal Reserve. According to the Conference Board CEO Confidence report, interest rates are at the top of the list, well-above tariffs, which are manageable in ways that the Fed’s miscues are not. This as we await the first cut on the Third Quarter (3Q18) Gross Domestic Product (GDP), which the Atlanta Fed is currently modeling at 3.9%. That might be considered a Goldilocks number after the quarter began with hints of a 5.0% GDP. This would be the right mix of steady growth, but it might not rattle the Federal Reserve. Of course, worrying about how long a Goldilocks economy will last is a high-end problem. Before we get to the GDP on Friday, investors need to know that this is the week where the big names deliver. And big tech is at the plate with its heaviest hitters. Today, we expect Turkey to release grisly photos and perhaps the audio and video recording of the murder of Jamal Khashoggi. Already, Canada has said it will suspend weapons sales (I’m not sure if it’s more of a virtue signal than an economic sacrifice) and, Germany is mulling over a similar decision. There will be pressure on President Trump to take dramatic action against Saudi Arabia, and I think this administration will. Meanwhile, we will listen intently to the Lockheed Martin (LMT) conference call after the company post results this morning. 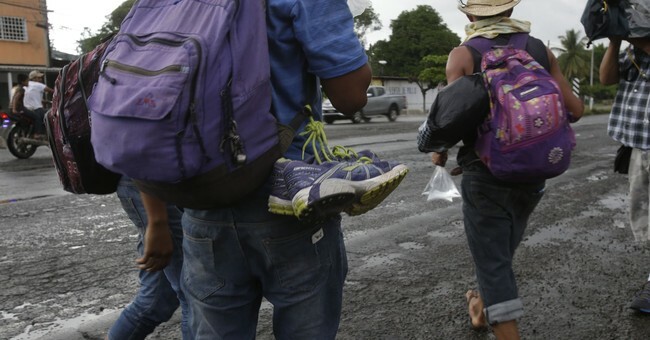 The Central American caravan, while an economic issue, is also one of those events that build momentum into a potential final showdown. I think it’s a great chance to argue for more centers to handle asylum-seekers, and to find a compromise to build the wall and deal with the Dreamers. President Trump says he will curb or stop aid to the countries the migrants have originated from. My question of the day - should President Trump stop sending money without more cooperation?